Record Store Day 2019 is this Saturday (4/13) and while the main event is the hundreds of exclusive, limited edition records being released just for the occasion (we have some picks), many stores in NYC are turning it into a big party, with live performances, giveaways and even sometimes free beer. 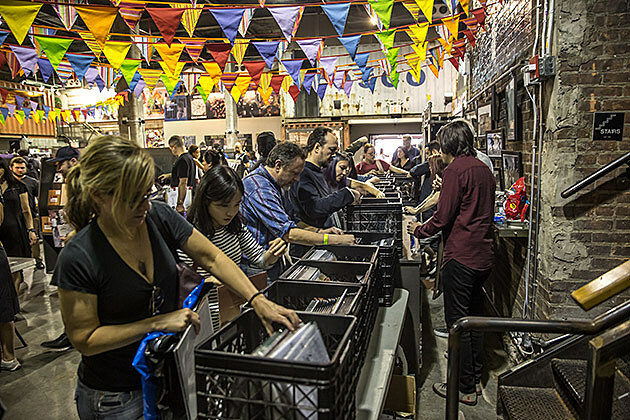 Here’s a guide to the RSD19 events we know about. As usual, Rough Trade in Williamsburg is doing the most and will have the most RSD exclusives in town. They’ll also have the longest line to buy stuff — the store opens at 9 AM and there will probably be people camping out all night. If you don’t care about buying records, Rough Trade has lots of other cool stuff going on, including performances by Steve Gunn, Cochemea (The Dap Kings), TEEN, Elijah Wolf, Pearl Charles, and Eli ‘Paperboy’ Reed; DJ sets from Charly Bliss, Chris Cohen, Sad 13 (Speedy Ortiz), Madison McFerrin, Ian Williams (Battles), The Range, and Blake Schwarzenbach (Jawbreaker); signings with Wayne Coyne (Flaming Lips), T Bone Burnett, and David J (Bauhaus / Love & Rockets). Plus, Richard Barone moderates a panel discussion on Lou Reed’s Ecstacy, and Rough Trade also hosts The Flaming Lips’ Kings Mouth art installation and screenings of Kevin Morby’s ‘Oh My God’ The Film. Details are here. Down the street at Halcyon (74 Wythe Ave), they’ll open at 10 AM with a selection of RSD19 exclusives, an “extended selection of used records,” and a full roster of DJs. Details are here. Heading further north, Academy Records Annex in Greenpoint (85 Oak St) will open at 10 AM and will have lots of RSD19 exclusives. As usual, they’ll have free stumptown coffee and Moe’s donuts throughout the day (maybe beer in the afternoon?). There will also be a performance by Prison — one of Paul Major of Endless Boogie’s other bands — at 7 PM. Also: if you need a change of pace, the NYC Hot Sauce Expo is happening this weekend, right around the corner at the Brooklyn Expo Center. Other Brooklyn spots: the just-opened Brooklyn Record Exchange in the Elsewhere building in Bushwick won’t have any RSD titles but they will be breaking out a stash of choice used records they’ve been holding onto for a while, and they’ll have DJs all day. Normal hours: noon to 9 PM. Earwax in Williamsburg (167 N. 9th) will open at 10:30 AM, and Captured Tracks in Greenpoint (195 Calyer) will open at 10 AM and both will have a selection of RSD titles. Record Grouch in Greenpoint (986 Manhattan Ave) is actually carrying RSD exclusives (they’ve been stocking selective RSD-official stuff for the last few years), along with tons of boxes of $1 records. 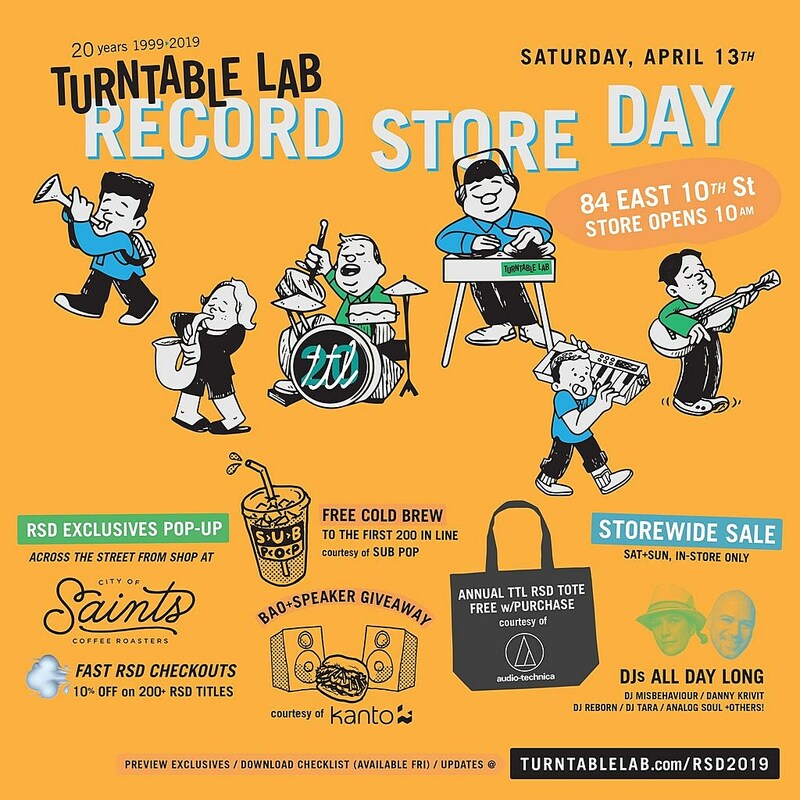 In Manhattan: Turntable Lab (84 E. 10th St) opens at 10 AM and they’ve got a dedicated pop-up shop for all RSD Exclusives across the street at City of Saints Roasters (79 E. 10th St). To speed things up, Turntable Lab makes a printable checklist of all the titles they’re getting in that you can mark with the titles you want, hand to the clerks and they’ll pull what’s still in stock. (Pretty cool.) There’s free cold brew for the first 200 people in line, and you get a limited edition tote with any RSD exclusive. Over at the main store, they’ve got DJs all day, plus raffles and more. Greenwich village mainstay Generation Records (210 Thompson) will open at 8 AM and, in addition to RSD titles, they’ve got limited Youth of Today “One Night Stand” 7”s and “one time only t-shirts for sale.” They’ve also got live performances by Mike Peters of The Alarm and The Drew Stone Hit Squad. More details are on Generation’s Facebook event page and the flyer is below. Don’t forget: Generation Records, Rough Trade and Academy Annex are the three places where you can get free tickets to the Industrial Accident: The Story of Wax Trax! Records event at Music Hall of Williamsburg on Monday (4/15) with live performances by Ministry and Cold Cave. More details here. East Village store Stranded Records (218 E. 5th Street), which was formerly Good Records, just opened last weekend and will have special hours on Saturday, opening at 9 AM and carrying a selection of RSD exclusives. Limited to One (221 E. 10th St) will be open from 10 AM – 8 PM on Saturday and “have stashed aside some rare items” just for Record Store Day. In Queens: HIFi Records in Astoria (23-19 Steinway St) will open at 8 PM and will have a “ridiculously huge” selection of RSD exclusives, plus live performances from Astoria artists Better Head, Ro Fino, Ruby Rae, Matthew Sucich, Supersmall and Ryan Harvey. Details are here. In Ford, NJ, Vintage Vinyl will open at 8 AM and be well-stocked with RSD exclusives. If you wanna head to Philly, Main Street Music is having a Record Store Day party with live performances from Baroness, Chris Forsythe, Rosali, and The Tisburys. All details are here. What else? More flyers below.